Your company manages a fleet that makes delivery or intervention rounds that regularly evolve according to your customers’ needs. You must therefore assign all the tasks that are scheduled to each of your drivers, in order to minimize the kilometres travelled while respecting all the existing constraints, including any appointment slots associated with each task or the limited carrying capacity of your vehicles. You have to do this planning for your entire fleet, sometimes over several days. 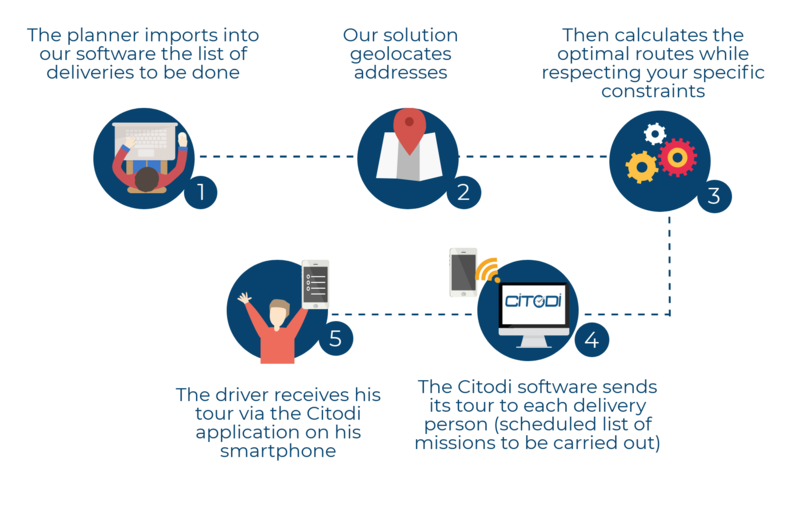 With Citodi, you have access to optimization algorithms that are among the most powerful on the market and allow you to obtain optimal delivery / intervention rounds in a few seconds to a few minutes that respect all the constraints imposed by your activity. Our solution includes by default a multitude of parameters and the natively open design of our algorithms allows us to add in our models your specific constraints for a tour optimization dedicated to your business context. In addition, you can choose the criteria you want to optimize: tour duration, kilometres travelled, CO2 emissions, or more complex objectives such as operational costs or the number of operations performed during the day. If you need to manage real-time issues in addition to that, this module connects directly to our real-time optimization and automatic dispatch solutions. Plan hundreds of operations on dozens of drivers in just a few minutes. Our route optimization solution allows you to reduce your operational costs while increasing your service quality. By using the solution to simulate your activity, you will be able to forecast your resource requirements based on the evolution of your business.